Clean and polish brass, copper, silver, gold, stainless steel, chrome, aluminum and more with Wenol all-purpose Metal Polish Easy-to-use polish comes in a convenient 3-oz. tube. Use regularly for long-lasting shine..
Set of 2 100ml. tubes. Ultra soft, packed with a gentle chemical cleaner that safely reaches deep into metals where stains hide and gets them out. removes surface rust, oxidation, stains, water spots, quickly restores to new again!!!!! 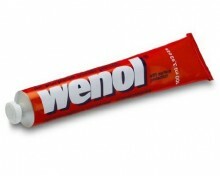 Click the button below to add the 2 tube of 3 oz of Wenol Metal Polish made in Germany to your wish list.